This isn’t a comprehensive listing of my viewing habits. I’ve also consumed some local news and spent one day largely zoning out to HGTV as I napped off and on. As I’ve recovered and increased my stamina I’ve been watching less TV and spending more time getting out and about. I still made time to watch a few games in the World Series and was ecstatic that the Cubs won this year! Woo hoo! Since I’ve moved to California, I’ve been almost exclusively telecommuting for work. I do seem to have reasons to get into the office in San Francisco at least once or twice a month, but most days I’m working out of my rental home in Napa. Even before I left Chicago I was telecommuting most days of the week. I had an assigned workspace in our company’s office in the Loop (Chicago’s business district) for a long time, but the trend towards “hoteling” did away with that about a year before I moved. Being a “hoteled employee” means you reserve your workspace either in advance, or you sign into one when you arrive at the office. My company had rules about what type of workspace you could request, and your level in the company had some impact on whether you could request certain types of workspaces. As a person who is fairly senior, I was able to request offices while I was in Chicago, and I usually could get one if I reserved far enough in advance. That’s not the case in San Francisco office, but I really don’t mind not having an office. Most people are quiet, and if a person needs to have a phone meeting, it’s usually easy enough to use one of the “telephone booths” set up for just that purpose. These are small rooms with a chair, a worktop, and a phone and they work well for their purposes. Offices are very different nowadays. The newest trend seems to be to set up long counters or tables with either no partitions or very short ones. Many people in the “open concept” offices are using headphones to listen to music or just keep out any background noise. For much of my career it seemed that it was a big deal to get your own private office. Now it just doesn’t seem to matter very much. As a telecommuter, my workspace is my entire house. Thanks to wifi, I can work in any room I want to work in, and I often do move my work laptop around with me throughout the day. When I’m making coffee in the early morning, I usually have the laptop in the kitchen with me so I can boot up and get logged in to my email while waiting for the water to get hot. When I eat meals, I’ll often have the laptop on my little dining table with me and work at the same time. But the place I have most often worked in the house is on the couch in the living room. I started doing that back in Chicago because then I could put my feet up, which was necessary when I had a broken ankle. I also found that if I sat that way I wouldn’t slump and hunch over my laptop. With all the issues I’ve been having with my right eye, though, my visual acuity has been inconsistent and has made working on my small laptop screen a bit of a problem for me. I started thinking about getting a big monitor that I could plug into, but then a conversation with a friend led me to start looking into getting a TV instead. So I’ve added a 28-inch Vizio smart TV to my work area and am enjoying having a nice big screen on which I can do my work. 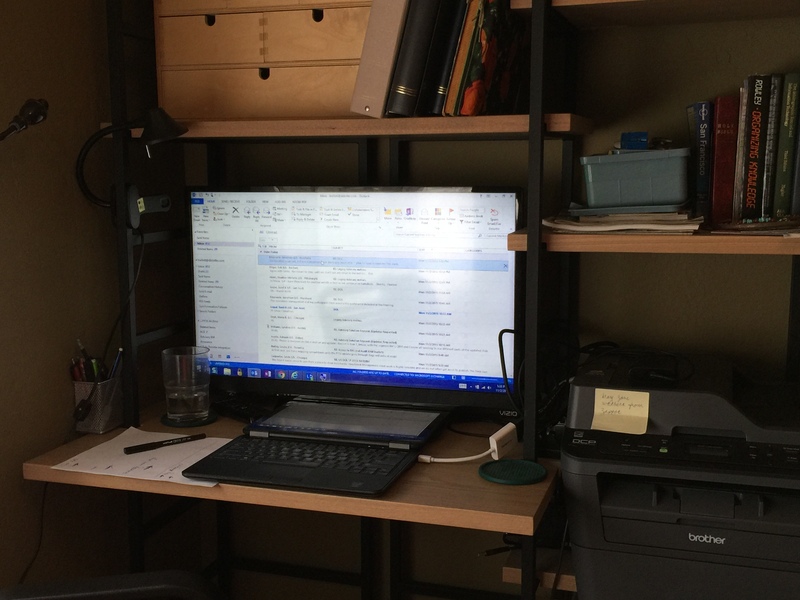 Now I have no problems reading my Outlook inbox, and I have the bonus of a larger screen on which to stream Netflix and Amazon Prime in my bedroom, too, since my work area is there. I haven’t had a TV in my bedroom in well over 20 years, so I’m not sure if this is ultimately good or not. I suppose it will come in handy if I’m confined to bed while sick, at least. A 28-inch Vizio smart TV used as a monitor. After reading Yarn Harlot’s blog today, I see that one of my issues with winter is that I don’t do winter sports. Unless shoveling counts as a winter sport, that is. I did some of that today, and if the weather report is accurate, I’ll have more to do tomorrow. Rah, rah. I can appreciate the beauty of winter. Dry, powdery snow looks awfully pretty in the right light: it’s so sparkly. The incredible irony for us is how we receive our HD signal: from a plain vanilla roof antenna. So, last February the satellite dish is set up and we got TV again. I was happy to have TV, but not so happy to be paying for it. I just don’t understand the concept of paying for TV unless I get it ad-free. Then, I can see why I’d have to pay for it. In the spring, we got a call from one of the guys we’d contacted that he could reconnect our antenna. Even though we had the satellite, we decided to go for so we could have a back up TV-viewing source. The HD tuner is built into the set, and it was capable of using dual antenna sources. So, we hooked up the roof antenna as well as the satellite and tried to tune in an HD channel through the roof antenna. (We weren’t paying for an HD satellite service, so that wouldn’t work). The only HD channel we tuned in was CBS, none of the other local channels worked. We were very disappointed, and figured that we needed a new roof antenna to pull in HD. So, we just gave up. After the new year, we were seeing all these notices about local programming being broadcast in HD. So, we gave the roof antenna a try again. Voila! We got LOTS of HD channels: CBS, NBC, ABC, WGN, etc. Our local public broadcast station, WTTW, broadcasts over 3 channels now, 2 of which are HD and show different programs during the same time slot. Awesome! I swear we’re watching the local broadcast channels more than the satellite channels that we’re paying for! Hmmm…maybe it’s time to get rid of the satellite, eh? Although I would miss Comedy Central and my South Park fix…Maybe after the winter TV viewing season is over. Excuse me now while sign off to go catch some TV.